The engine crew chat with tour passengers on a sunny but freezing cold Saturday 13th February 1965, as LMS rebuilt "Royal Scot" 4-6-0 No.46115 "Scots Guardsman" is raring to go as it waits at the head of the RCTS "Rebuilt Scot Commemorative Railtour", 1X80, at Crewe station. Departure time was 09:15 and the destination was Carlisle via Blackburn, Hellifield and the Settle and Carlisle line, return via Shap. 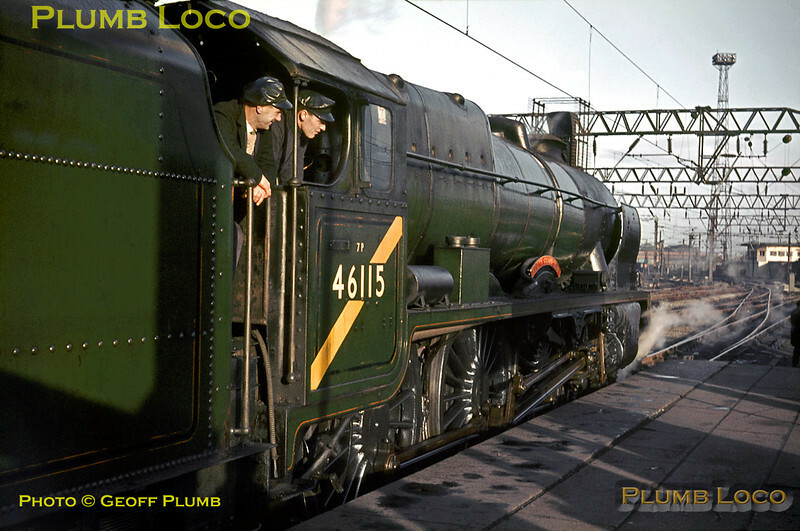 The nameplates on the engine are wooden replicas, the few survivors of the class expected to be out of service soon after, though in the event a few soldiered on until October 1965. Happily, this engine survived and has now made a return to main line metals. The yellow diagonal stripe on the cabside denoted that the engine was no longer allowed to work south of Crewe under the overhead line equipment. Slide No. 1147.